Fast Lane for bicycles, Fat Lane for motor vehicles. "Is riding a motorcycle a good way to lose weight?" a co-worker once asked me, back when I had a job and was commuting to work on my Royal Enfield. "Well, I don't know," I pondered. "You sure do see a lot of fat motorcyclists!" So I think we can rule out the Royal Enfield as part of a health conscious weight-loss program. But I was amused recently to note that some wag had added his own markings to the bicycle lane on Northeast 15th Avenue near my home in Fort Lauderdale, Florida. 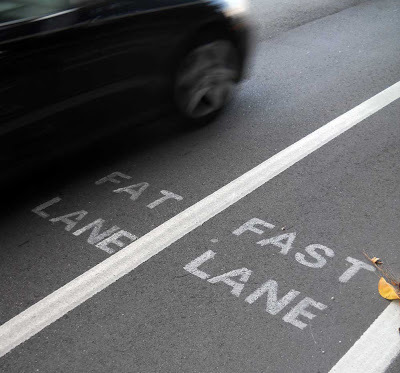 "FAT LANE," it suddenly said, in the part of the roadway used by motor vehicles. "FAST LANE," it read, in the part of the road reserved for bicycles. The markings looked official but they just can't be — can they? The Transportation Department isn't normally known for its sense of humor. I wonder who did paint them. And, as for weight loss? I guess it depends on what sort of two-wheeled Royal Enfield you choose to ride: powered or pedaled. I've had that same question go through my mind. There is some back, leg and arm strength that goes into riding a motorcyle.